Isn’t Pinterest just for women? Does anyone even really use Pinterest for anything? My digital marketing efforts are tough to manage as it is, why do I need to even consider Pinterest to dilute my already thin advertising budget? In this guide, we’re going to address these possible Pinterest pitfalls and break down exactly how Pinterest works, and why it is valuable to digital marketers and marketing agencies – especially those who are trying to sell products. When advertisers strategize their campaigns, the discussion inevitably starts with Google or Facebook. And why not? Those are the biggest players with the most reach. They have the most advanced algorithms to help you get in front of the right audience, and those audiences tend to have the most potential. With ‘only’ 200 million users, Pinterest might seem like an afterthought that’s not worth the trouble. However, this social media platform – that helps users gather information on brands and products – can deliver valuable results for the right client with the right strategy. Although it is a statistic delivered from the company itself, Pinterest users are almost 50% more likely to be introduced to a brand, which is a compelling statistic when considering Pinterest for paid social media outreach. In the digital marketing world, conversions and bottom-of-funnel activities usually reign supreme because of ROI and CPA targets. Thus, it can be less practical to put together an actionable marketing plan with clear metrics on improving revenue and profit. But, also consider the fact that 93% of Pinterest users say they use the platform to plan purchases. Again, that is a Pinterest sourced statistic, yet it’s quite compelling when you’re talking about driving revenue and purchases. Pinterest is a place where users save and share ideas, content, products – and we all know the value of referrals, testimonials, and reviews. The trickle down effect of acquiring users for the top of your sales funnel can be hard to measure, but there’s no doubt that if you are acquiring users that are brand aware, you’re doing something valuable for your company’s bottom line. Sharing is a big part of Pinterest. When you save a Promoted Pin, it is shared to your followers. The sharing and bookmarking are where Pinterest really shine. Users will get ideas from trusted influencers who can impact what the masses like, share, pin, and eventually purchase. It is this expression of self that is innate in all of us, and if you can target the right audience with the right content at the right time, your brand can reap the rewards of being shared, bookmarked, and eventually purchased. It’s time to start Pinning! You’ll want to set up a business account to get started, which is a similar process to opening a user account. In your profile setup, give as much information as you can. This is where users will learn more about you once they find a Pin from you that interests them, so make it as easy as possible for them to learn all about you. Make sure you have a logo or image that best represents your business. In your ‘About You’ section, use keywords that describe who you are, but also remember to be targeted about the keywords that you use. Pinterest is about what people want to do, purchase, or achieve. It is not uncommon to see the word ‘dream’ come up a lot in Pinterest boards. Users are focused on their dream vacation, dream wedding, dream closet, dream kitchen, dream man cave, and dream house. Pins inspire their users to think big, and you’ll want to have this inspiration mindset when planning out your Promoted Pins. You want to think about your products in the dream and inspiration context. Then, you will want to strategize a way to present your products on Pinterest to best captivate your audience so that they’ll want to share or bookmark your Pin. You gotta get those referrals and testimonials we talked about earlier! This is what Pinterest is about: Users share, comment on, and repin Pins. Users are sharing ideas, and you want your idea to be a part of the conversation! For example, show new ways to use your product. Arm & Hammer Baking Soda taught us this classic marketing 101 strategy when they advertised using baking soda as toothpaste amid lagging sales. Find ways to educate your target audience in a helpful and engaging way. Pins are the format by which Pinterest operates. They can be images or videos. Test as many images as you can to see what works best for your audience. Pinterest can be a great staging area for experimentation to see what resonates with your audience. Don’t be afraid to try new things. Be tasteful about your images. Subtle logos and branding can soften the hard sale and make your product seem less in-your-face. Use lifestyle images. In the same vein as being tasteful, lifestyle images can show your product in action and subtly give context. Text overlays can help brand the image and add useful information. Show your personality, but don’t overpower the image. Sometimes, however, it doesn’t pay to be subtle. Use text overlays for CTAs or to bring attention to a specific user benefit or unique selling point of your product. Make the typography simple and large enough to read; you don’t want users squinting and reading a whole paragraph about your product (which defeats the purpose of the image-focused Pins). Use high resolution and non-pixelated images. The image is the crux of the Pin, so spend time and effort on making sure your images look great. Pay attention to the vertical aspect ratio, which can affect how the image appears on Pinterest. The ideal aspect ratio of images is 2:3 and 1:3:5. Tall up-and-down ads take up more real estate and work best, but don’t overdo the tall aspect of it. The minimum recommended width is 600 pixels. Finally, because Pins have a longer life cycle on Pinterest, it is good to put a date on the Pin, especially if you’re running a contest or timely type of Pin to make sure it doesn’t get confused engagements later. Make a video to share. Video content, in case you haven’t been to YouTube in a while, is all the rage. Show your audience how to do something related to your product. People love how-to videos, especially if these videos are related to subjects and topics that they love. When starting a board, you’ll want to be clear about the description and what will be pinned to it. Try to keep the title under 20 characters because anything over that gets cut off. Build a board and have a board strategy. Make sure your keywords, description, and title are on point for your boards. Add relevant Pins to it and choose a cover Pin to represent your board. Featured boards allow you to highlight certain boards to represent your brand. If you have multiple product or service segments, this is a good way to build out separate boards for each, but still prioritize the most important segments. You can use five featured boards and order them the way you like. 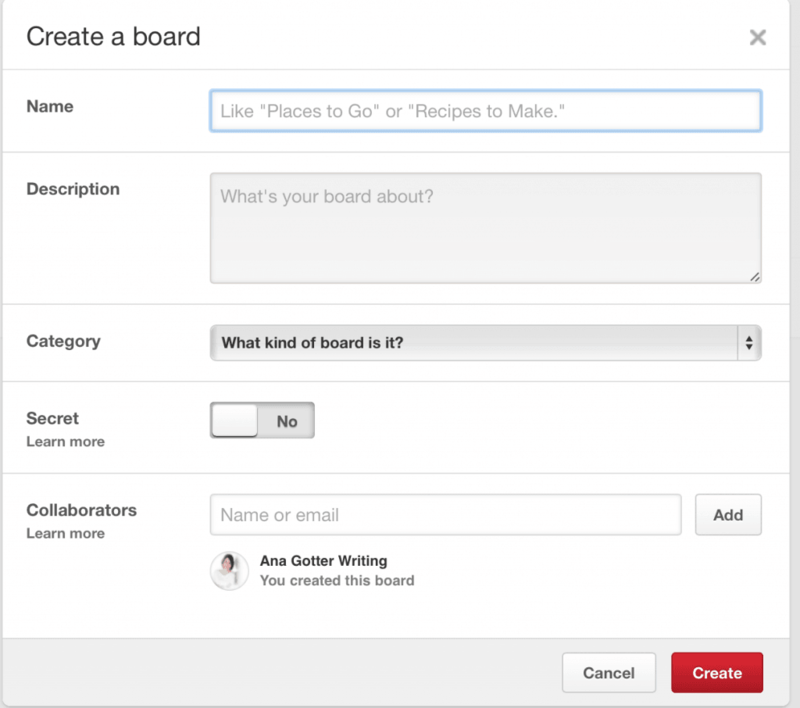 There’s even Pinterest ‘secret boards’, which can be a holding area for Pins to be seen only by your team. This can be a great place to gather information for brainstorming sessions, or a rough draft board for a specific client or project. There are an unlimited number of secret boards available to you. Don’t worry about how secret boards appear to the public, because they don’t appear to the public at all (hence the ‘secret’ part). Secret boards are only available to view by people you invite. However, once the secret board is made public, everything on the board will be viewable by the public. Start a Pinterest business page and start tracking users and engagement. You will also be able to track your Promoted Pins and other Pinterest advertising efforts with Pinterest’s analytics. Use these metrics to optimize products, images, and segments to increase awareness of your brand. 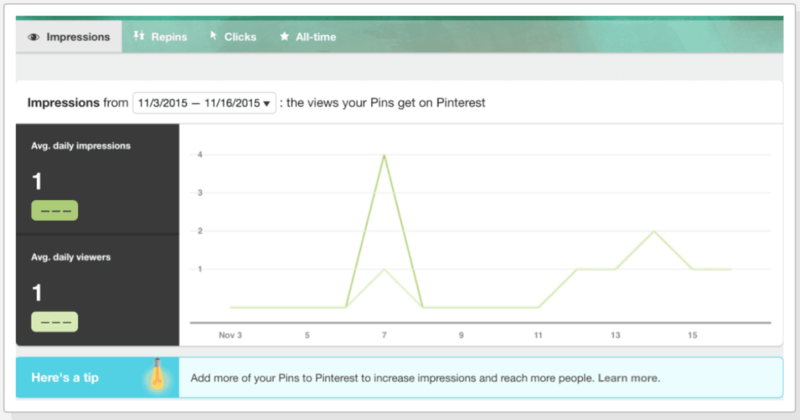 Don’t just rely on Pinterest Analytics to analyze your campaigns. You want to build out tracking parameters for your URL when sending traffic to your website. Seeing how Pinterest advertising efforts compare to other traffic sources – and how Pinterest traffic contributes as a touchpoint to the overall customer journey – is important in attribution and figuring out Pinterest’s value in your digital marketing efforts. 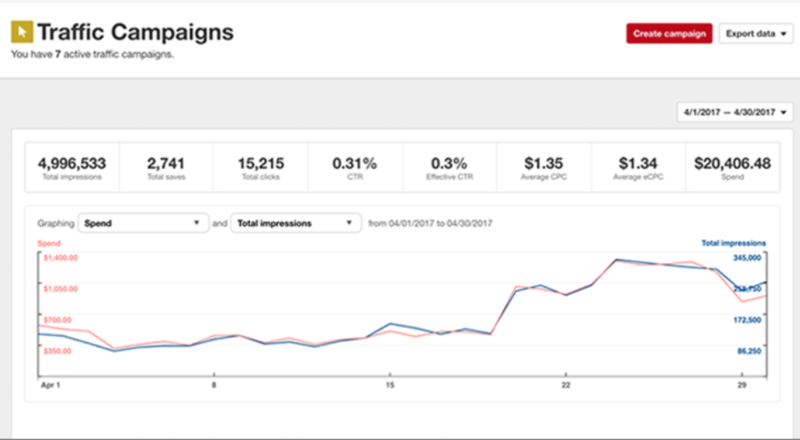 One way you can easily build out tracking parameters for your Pinterest campaigns is to use the Campaign URL Builder within Google’s tools. You also want visibility on which keywords, ad groups, and specific ads perform. This granularity will be crucial to optimizing and learning more about what works. Monitoring your Pinterest profile analytics is a good way to see how your brand awareness shifts based on the various campaigns that you run. You can break down your impressions by Pins and boards. You can get metrics on pins, repins, repinners, and boards. You can also get click data on all of the above. Pinterest provides a way to understand the interests of your audience, and this is a great way to continue to understand your target audience better so that you can serve ads that get better engagement and conversions – and that ultimately have a better ROI! You can learn about the demographics of your audience and their interests. 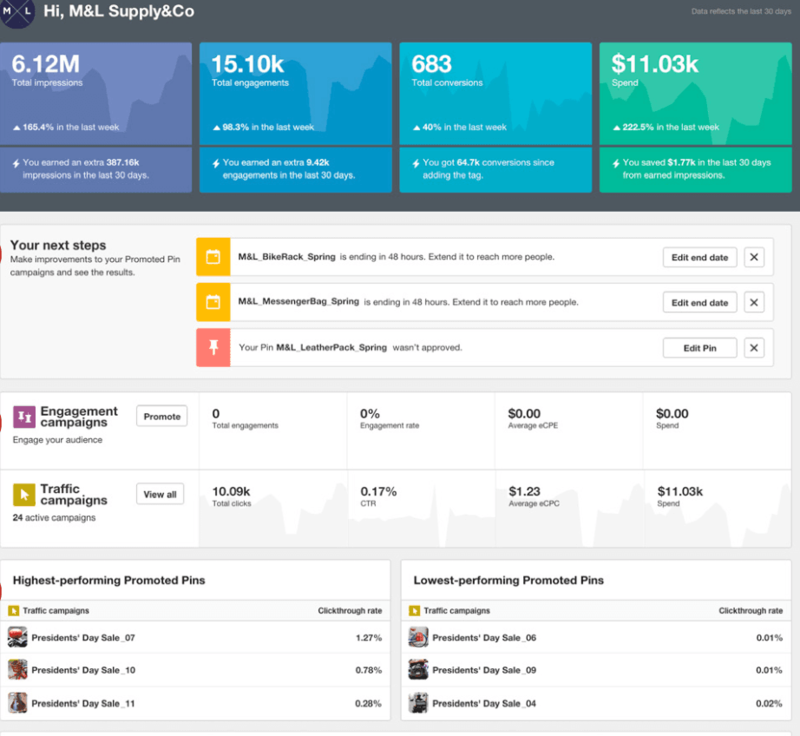 You’ll also be able to see which boards have your Pins and other brands that your audience likes (hello competitive analysis!). And don’t forget to see what other content is out there competing with your own. You don’t necessarily need to copy what other marketers are doing, but their ideas will only enhance your strategy. When you set up your campaign, you can choose between showing up while users browse and/or when they search. Split up campaigns by placements to see how performance goes for each type of placement. Different brands will experience different levels of performance for each placement, so don’t make assumptions when you leave out a certain placement. Also, when you use both placements in a single campaign or ad group, it may provide more narrow targeting, but it will be less clear which component is responsible for the performance. 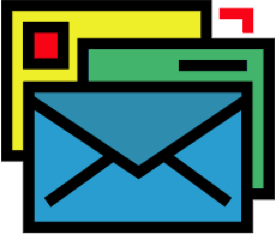 Segmentation of campaigns, like in all marketing efforts, is a best practice to isolate variables that can be responsible for performance. One of the ways users can find your content is by searching keywords, so finding relevant keywords for your brand is crucial to your Pinterest branding strategy. 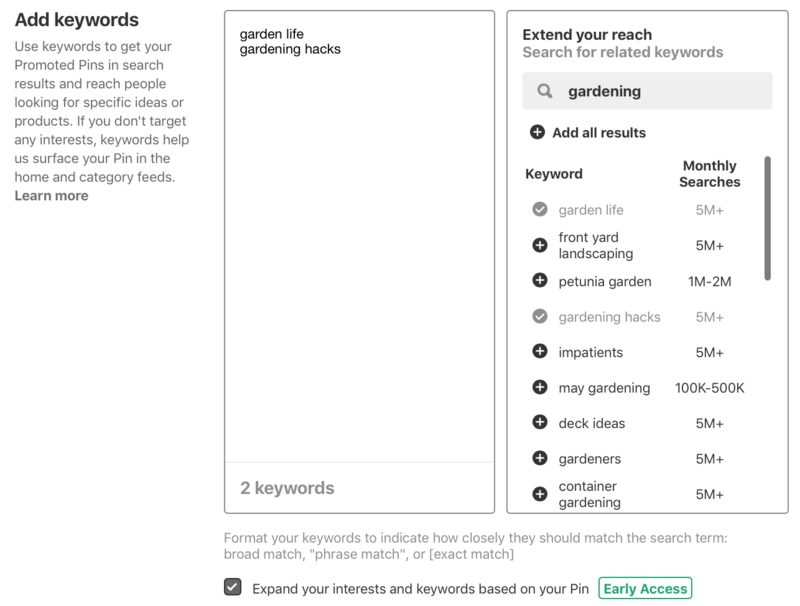 Pinterest allows you 150 keywords for a Promoted Pin, but recommends that you only use 20-30. Choose search targeting for keyword focused campaigns to be more granular about your campaign and ad group segmentation. 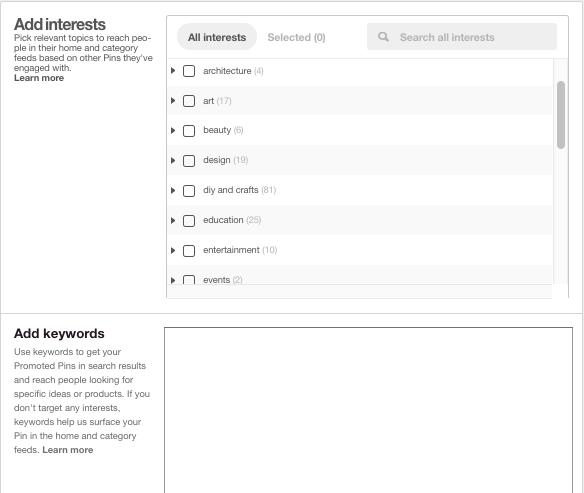 Use the Pinterest search bar to search terms relevant to what you’re trying to promote to get ideas on what other terms your target audience could be searching that are relevant to your campaign. You can bid on exact, phrase, and broad match keywords – just like in Google Ads or Bing Ads. Pinterest reveals the importance of keywords by using this method. Just like when you do paid search advertising on Google or Bing, start narrow with exact and phrase match to understand how well the keywords work. For high performing keywords, expand to broad match when appropriate, but keep in mind negative keywords, too. Pinterest will give you an idea of search volume for certain keywords, but you’ll definitely want to experiment with different keyword groups to see how various segments perform. Don’t be afraid to get creative. You can narrow your audience by locations, languages, devices, and gender. Know your target audience and if it can be narrowed using one or all of these attributes; the more detailed your audience, the better. Pinterest has over 400 different interest targets, with sub-interests within those. They have also expanded this with their Taste Graph, which we will talk about in a bit. Use these in combination with keywords to narrow down your target audience significantly. However, it’s best to separate campaigns and ad groups based on either interests or keywords to see how each segment performs. Just like with high performing audiences on Facebook and LinkedIn or high performing exact match keywords on Google Ads, your best pins should be bid up and promoted heavily, because you know they work! Once you’re done maximizing revenue and engagement, you can start to expand to your less popular content. As we’ve mentioned, segment your campaigns by different advertising variables as much as possible to determine how well (or how poorly) specific attributes perform with your audience: offers/landing pages, keywords, interests, mobile, and desktop. There are various campaign goals available: get traffic to your website, build brand awareness (get lots of impressions), boost engagement with your Pins, etc. You’ll also want to segment campaigns by your goal (often this coincides with segmenting by offers or landing pages, which is the best practice). Segment ad groups by Pins and landing pages. Just like you would segment ad groups based on keywords or offers on Google Ads or Facebook, you want to segment your Pinterest Promoted Pins as granulary as possible to isolate differentiating variables in your ad groups or campaigns (keywords, pins, landing pages/offers, etc.) to see not only which promotions perform better, but also to understand why. Like all of the other social media platforms, Pinterest has a conversion tag that allows you to track conversions and actions across your site and target users on Pinterest based on your website data. They have a base code snippet that you install across your site, and also an event code that you install whenever you want to track conversions. You can then create audiences based around these conversions, and that can come in handy – especially for Ecommerce companies that have multiple touchpoints that can be retargeted. You can easily access the conversion tag setup in your business account under the ads section. Now that Pinterest has the capabilities of the Pinterest tag, publishers can target their website traffic just like with the other available social media marketing platforms. 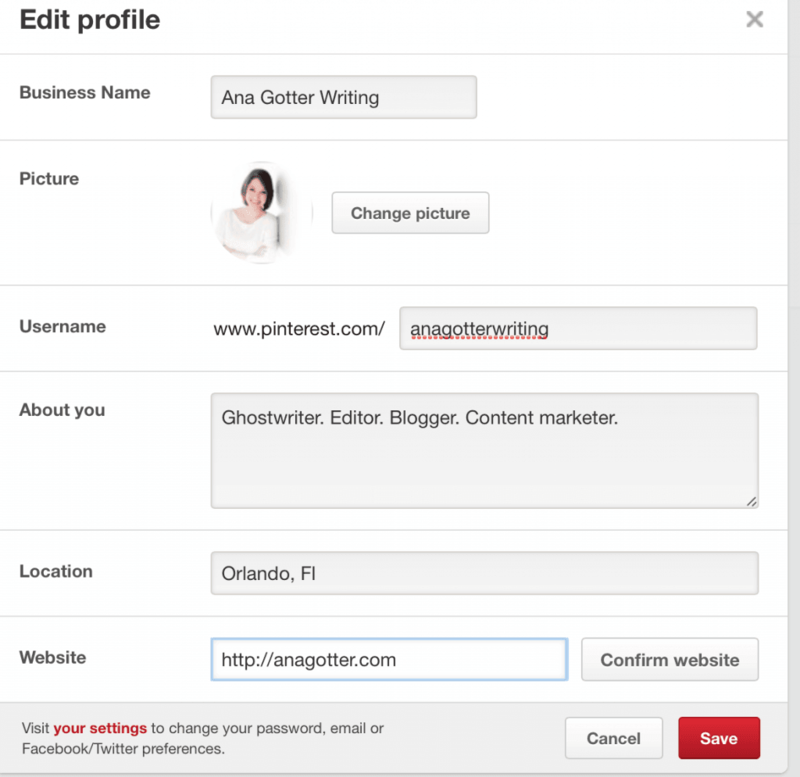 You’ll need to work with a Pinterest Marketing API Partner. Rich Pins show metadata on the Pin and give Pinterest’s users a richer experience. This data is in addition to descriptions, which is incentive to add this to qualifying Pins. The use of metadata from your website that you can associate with Pins connects the information from your website with your Pins. If you’ve taken care to make this metadata relevant, it definitely won’t hurt performance to connect this data to the appropriate Pins and will probably be quite beneficial. 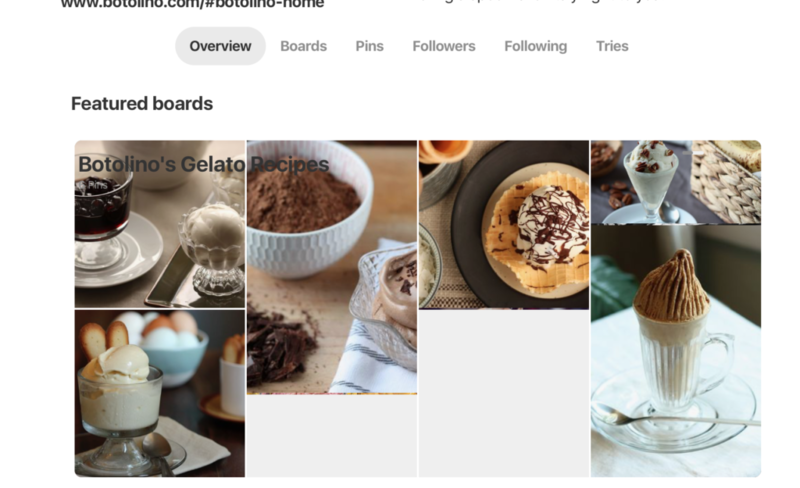 Pinterest encourages this by listing the available metadata layering that is possible for article, product, and recipe Pins. Rich Pin metadata also updates automatically, keeping your pins relevant. 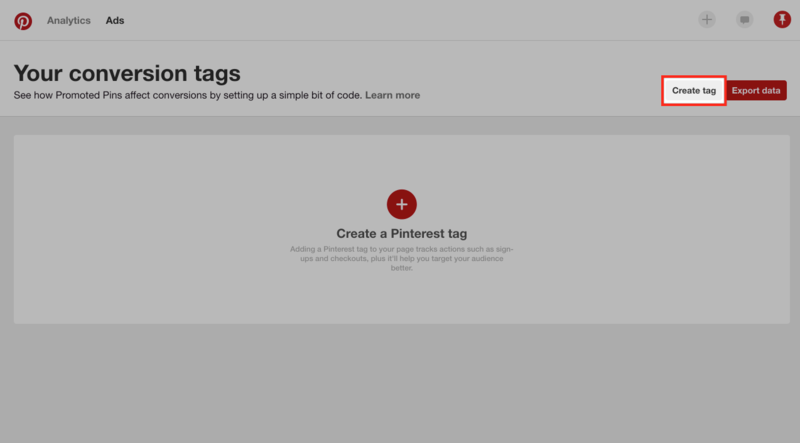 Pinterest supports Open Graph and schema.org formats for marking up your Pins. You’ll need to apply for Rich Pins by validating your URL with Pinterest. As the name implies, just one tap on these pins takes you to the landing page for quick access to a landing page of your choice to engage users who are ready to purchase or learn more. You only need 100 users to activate this list, which is similar to one of your other audiences that you are already targeting successfully. There is a sliding scale similar to Facebook’s 1-10, where ‘1’ most closely matches your target audience. Just like Facebook’s Lookalike Audiences, this is a great way to build on your high-performing advertising audiences to prospect to similar types of people. It is best to start out with Actalike Audiences that match best (1-3) before expanding out to the higher numbers, which have a lower chance of acting like your original audience. There is an argument that a click at any time of the day is relevant because the content and landing page don’t change. There is no evidence that clicks from users at off-peak hours convert less (unless you’ve done a specific scheduling analysis on your conversions and have found this for your niche). However, if you don’t have an unlimited budget and you want to maximize the audience you can reach, then scheduling Pins at various times of the day can maximize your reach and frequency – and possibly your ROI if you have consistent conversion and engagement metrics. 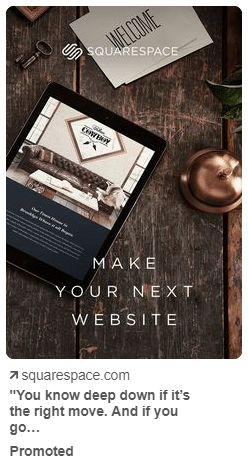 When you are running ads that take your audience to your website you’ll want to use a clear call-to-action (CTA) in your Pin descriptions, just as you would with any other pay-per-click ad. Each click costs you money, and you want to gain value from that money spent (ROI). As we’ve said earlier, you’ll want to implement conversion tracking, whether it is in conjunction with Pinterest’s platform or whether you set up your conversion tracking through Google Analytics. The easiest way to set up conversion tracking is to have a ‘thank you’ page that can only be seen once a user performs a certain action. You should have a desired action or outcome whenever you send traffic to your website, especially from a pay-per-click advertising platform like Pinterest. Instead of the approximately 400 interests by which you could target Pinterest’s users, advertising publishers can now use about 5,000 interest categories to target more granular and obscure interests to increase engagement and conversion rate. These options are now available in the Pinterest Ads Manager. It is worth checking out all the different interests to see which ones are relevant to your audience. 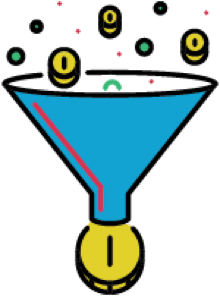 Create parallel campaigns with successful campaigns that you have been running and see how these new audiences affect the performance of your ads. Even uncovering a few winning interests will make it worth the time and effort. Create widgets on your website or app to allow easy follows, pins, and boards. Using awesome facial recognition algorithms, Pinterest’s engineers are starting to allow users to take pictures of objects which Pinterest Lens will analyze and suggest ideas based off the image! This is as high-tech as it sounds. Imagine taking a picture of a sweet bag you saw someone wearing at the mall, and finding where to buy that exact bag by having Pinterest analyze the picture of the bag for you. For those publishers using Shopify or BigCommerce, you can now post Pins for products that can route users to buy a product with minimal friction from all the steps normally involved with buying online, like entering in payment and contact information. Many of the publishers on Pinterest sell products anyway, so this is a great way to expand the reach of their Google Shopping or Amazon Shopping campaigns. You’ll first have to apply for Buyable Pins via Shopify or BigCommerce. Once you’ve been approved, you’ll start to see that your pins that link to specific products will have an ‘Add to Bag’ button. Make sure your Buyable Pins link to a specific product page and not a category page. Remember to save your Buyable Pins on your public boards to get maximum visibility by your potential audience. 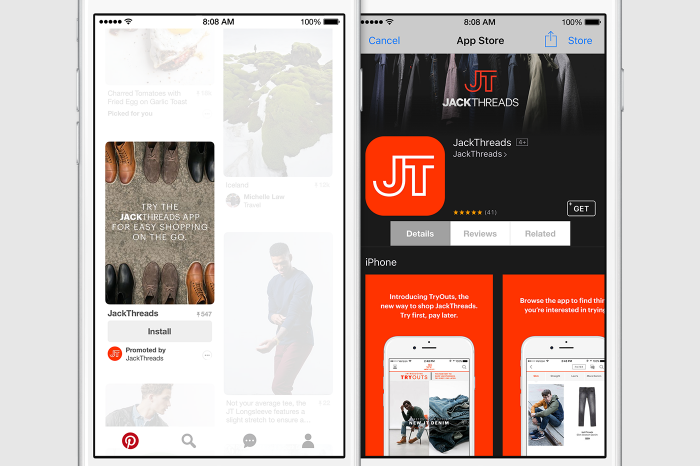 Download Pinterest’s Browser Button to save the products you want to start selling on Pinterest. As you can see, Pinterest is not a social media platform to be underestimated anymore, especially if you’re a brand with consumer products. Pinterest is basically a place you can allow qualified and interested users to window shop, and it allows you to subtly put your best foot forward for branding yourself (and they expect you to woo them!). It doesn’t get any better than that. Happy Pinning and Happy Revenue Making!